I can’t believe that it’s already time for another What I Ate Wednesday! This week has flown by and as you can see from my recent posts I’m in a bit of a whirlwind here. The days have passed but I’ve been very productive so I’m happy with that. I remain boxed in…meaning I’m still working among the boxes and general stuff around here. The good news is, there are many fewer boxes than there were. I would have accomplished more if I hadn’t had to clean up water from my leaking air conditioner, but more on that another time. We’re here to talk about Food! Thanks to Jenn at Peas & Crayons for as always being our gracious hostess for the Foodie Madness that is WIAW! Be sure to visit there when you’re finished here. There’s always something good to eat over there! Starting with breakfast…in fact this edition of WIAW is pretty breakfast-centric. At least I’ve been eating breakfast, which I was ignoring for a while. 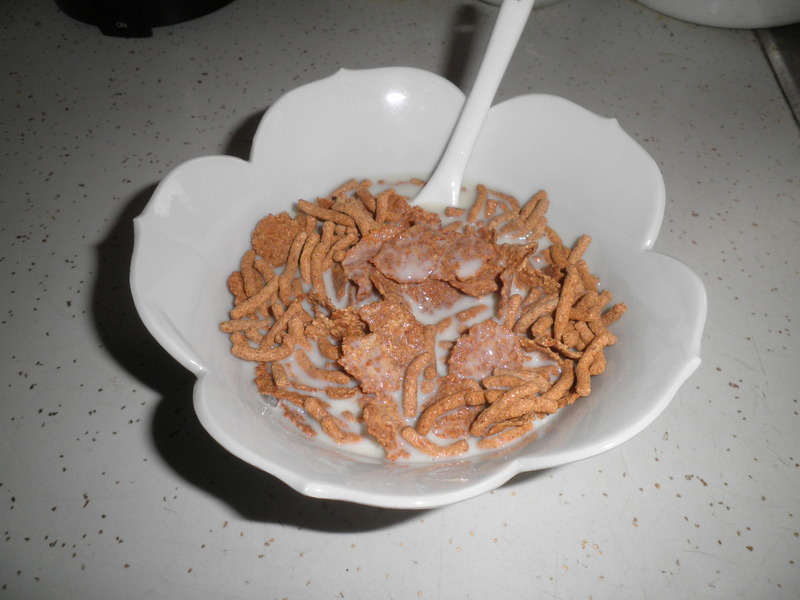 My recent and current favorite…bran flakes, Fiber One and soy milk. This is delicious and keeps me satisfied for a long time. Good thing in a breakfast! A big salad in my Big Purple Bowl. 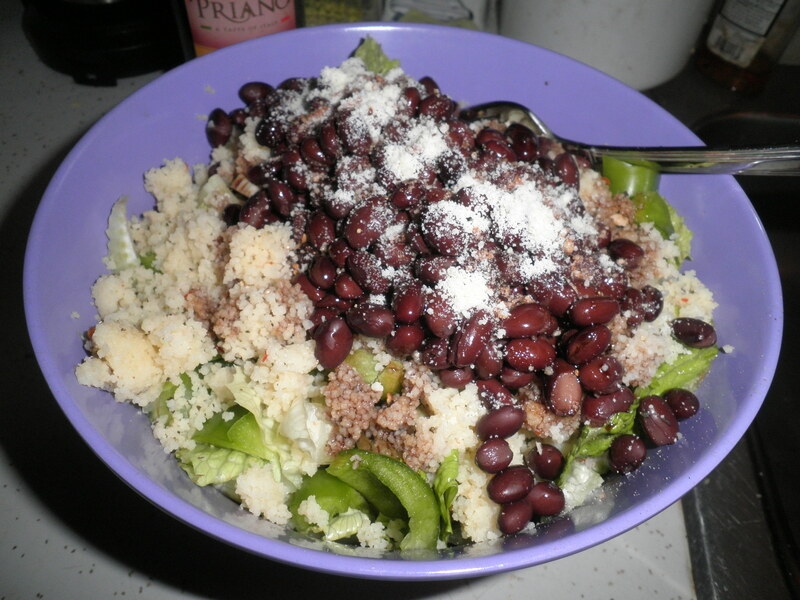 Black beans and couscous added to bulk it up. I need to get back to making grains to add to my salads. I always enjoy them that way. Ok…so I didn’t really need to eat this. 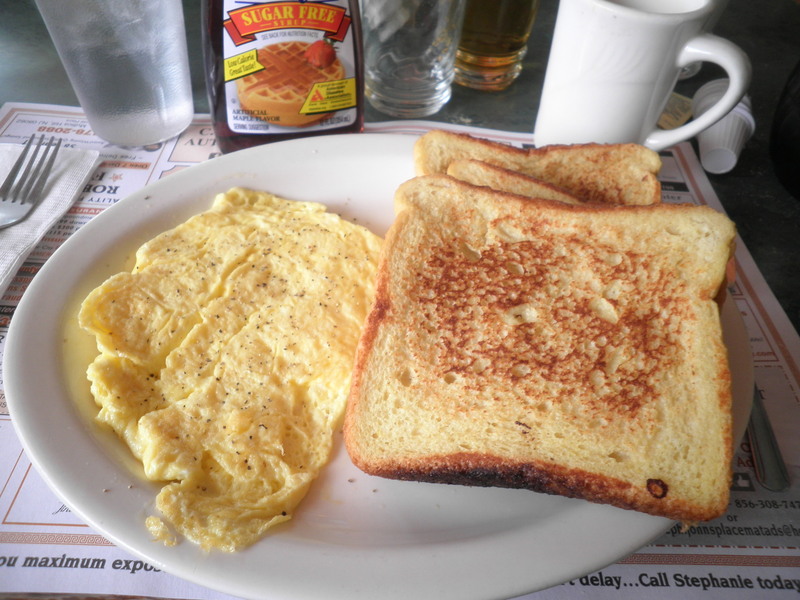 French toast and scrambled eggs. This was delicious and really too much for me to eat. I did enjoy it and made the concession of having sugar-free syrup with it. I don’t do this very often. A little more appropriate. 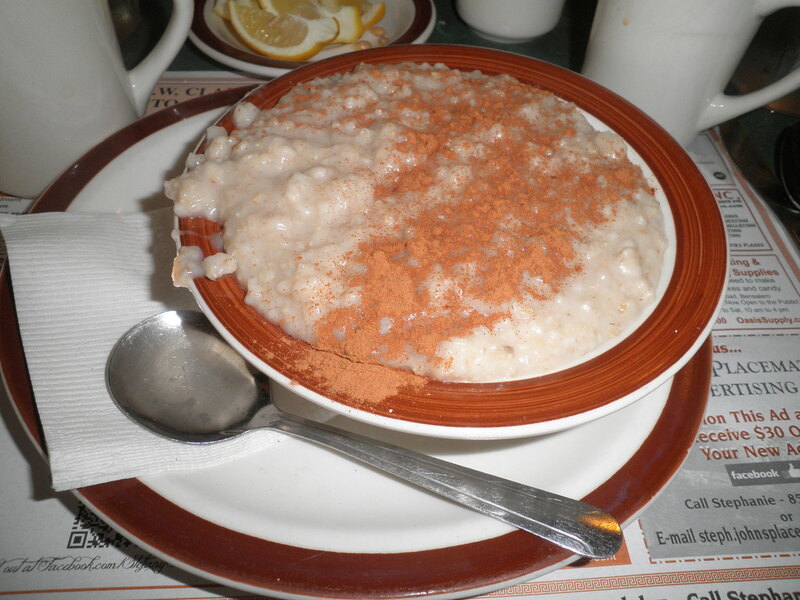 I love ordering oatmeal out. It just tastes better. This was actually eaten because my stomach was kind of upset. You see, I succumbed to pizza on Saturday night and suffered for it on Sunday morning. Maybe the french toast was part of it too. I should know better…I’ve been eating so healthy lately that things like pizza just don’t sit well. I’ve learned my lesson! Last but not least, back to a Big Purple Bowl salad again. This time with home cooked pinto beans cooked in the crock pot. Just love making beans this way. So yummy. I’ve even figured out how to reduce the amount of what I cook so I don’t run the risk of them going bad. I hate to waste food…especially beans! Also making an appearance here is a treasure found in the cupboard. Clearing out is a good thing. I found this great cup with a straw that I used to use when I was working. Works great for my iced tea. Less chance I’ll knock it over and spill it…I’m a bit clumsy! This post seems rather short this week, but in truth, I’ve got work to do. As much as I love WIAW, I’ve got to get back to my projects. I’m feeling so good about all that I’m accomplishing. I’m going away in two weeks so I need to get as much done as possible. Then when I’m away, it’s Ralph’s turn to work on projects! Be sure to visit Peas & Crayons and check out the other bloggers linking up there. There is quite a crew and remember we all love your comments, so leave a few! This entry was posted in Uncategorized and tagged beans, Big Purple Bowl, crock pot, sorting and packing, WIAW. Bookmark the permalink. Thanks, Jenn, I’m feeling much better! I just need to not splurge with things like pizza anymore…at least not as much as I ate on Saturday. 😉 I’ve been doing such healthy eating that eating outside my routine really worked against me. Have a great day! Your salads look so good! Your beans cooked in the crockpot can definately be put into indiv servings and frozen so you don’t have to make them as often. I love quinoa or brown rice added to salads. Well…I guess I’d better check on how the oatmeal is made…I never thought of that. I’m having fridge/freezer issues at the moment. It’s not performing up to speed but I see no reason to buy a new one since we’re hoping to move soon. It won’t freeze anything so I have to buy as I go. No fun, but we’re getting along. I really can’t complain…it had belonged to my Grandparents (I moved into their house) and it’s going on 42 years old!! Have a great day! Oh, and that stinks about your air conditioning. Remember when I said that ours wasn’t working a few weeks back? Well, we just got it replaced this week and I’ve been told that our house is nice and cool now. It seems like our bad luck switched places 😛 Hope Ralph can get it fixed! Have a great day Fran. Thanks, Madison. The P.S.E & G. man was here and it’s not leaking anymore. Glad yours is fixed too. I guess my body was just saying, “stick with what’s good for you!” Funny how that works! Have a great day, Madison! 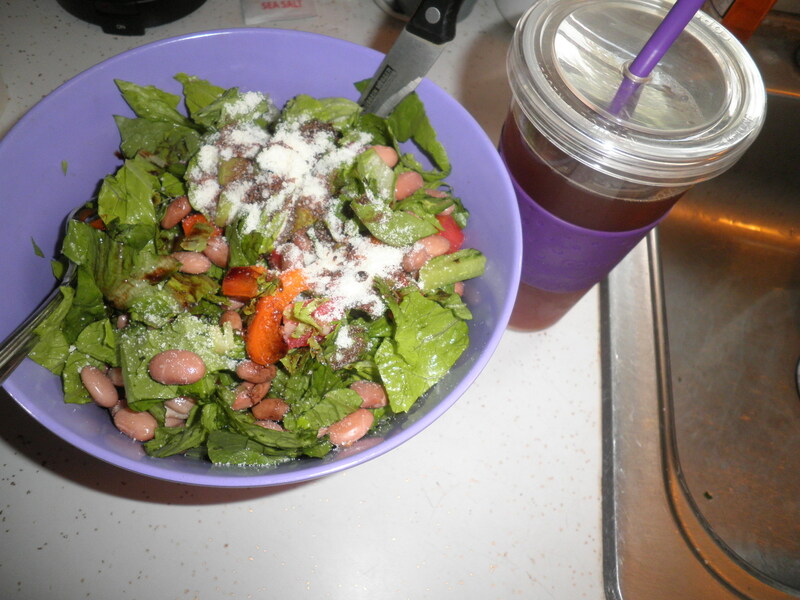 I love a big salad bowl and adding beans is a great idea for bulking them up. Keep up the good work Fran, and I hope your stomach feels better soon. Thanks, Meghan…nearly back to normal.